In the spring of 1536 it would be a severe understatement to say that things were not going well for Anne Boleyn. She was the Queen of England, but unable to carry and give birth to the living son she had promised her husband, Henry VIII. She was imprisoned in the Tower of London, having been arrested on charges of adultery with five men after a false confession by her lutenist, Mark Smeaton. In her possession in the Tower, and likely providing her a tiny bit of solace, was a songbook with favorite music she had collected throughout her life. 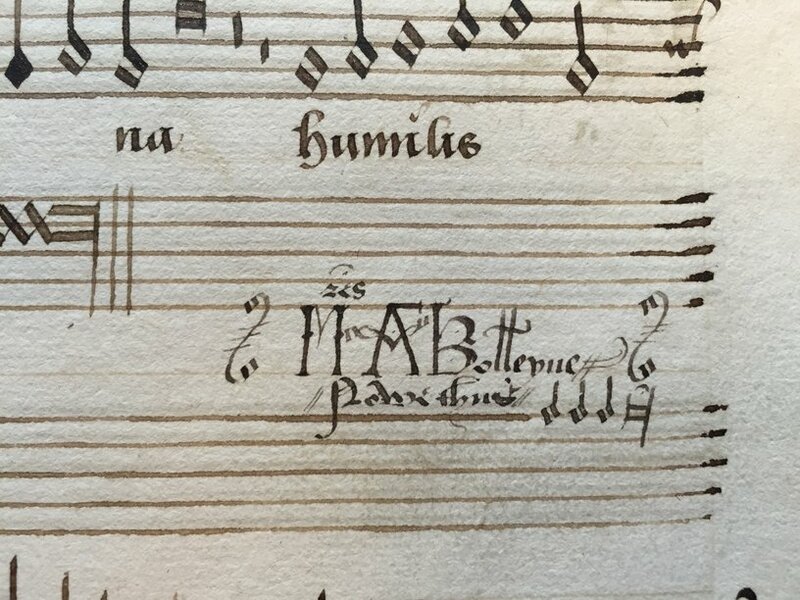 Now for the first time in 500 years much of the music included in Anne Boleyn’s songbook has been recorded by the Alamire Consort, under the direction of Dr. David Skinner of Sidney Sussex College, Cambridge University. Almost like a scrapbook, it is filled with music to which Anne would have been exposed in France, and at the court of Margaret of Austria as a young teenager. Skinner points out that Margaret was a musical patron to many famous composers like Josquin or Pierre de la Rue, and Anne would have known them and heard their new works as they were first performed. It’s also possible that some of the music included in the Songbook was composed, or written down by Anne herself. The idea that Anne sang to Henry from it during the early years of their heady courtship isn’t too far fetched. The songbook itself is kept in the library of the Royal College of Music and has been known as Manuscript 1070, having surfaced and been donated to the RCM in the 19th century. It is a beautiful book, filled with detailed notation that is a mixture of both the English and French styles. The evidence that it belonged to Anne, at least at some point in her life, is convincing. Towards the center of the book there is a marking written in English that reads, “Mistress Anne Boleyn Nowe Thus,” with a bit of musical notation below. Nowe Thus was the motto of her father, and so we can surmise that it was created before she became Queen. After she was Queen she would have used her own motto (The Most Happy) and would not have referred to herself as Mistress. One composition also depicts a falcon, the badge used by Anne, pecking at a pomegranate, the badge used by Catherine of Aragon, Henry’s first wife. Interestingly, women are the source of many of the manuscripts we have for music of this time period. While women played little role in the creation and performance of music outside the home, they were expected to have musical talents which they could perform in various social settings. It was not uncommon for women to keep songbooks like Anne’s, which give us a great deal of information both about the women who collected the pieces, and the tastes of the court, or patrons. Whatever its relationship to Anne, Manuscript 1070 is one of the most important examples of French Renaissance music anywhere, in part because it wasn’t in France during the chaos of the Revolution, when many manuscripts were destroyed. Anne’s songbook contains 42 pieces, a mixture of religious music and three French chansons; one of those in particular is tantalizing to contemplate. Jouyssance vous donneray, by Claudin de Sermisy, is a chanson that opens with a verse promising that the singer will give the listener pleasure, and will ensure that what is hoped for will come to pass. Dr. Skinner believes that this may have been set specifically for Anne and Henry, and Anne may have sung it to him. Of course we know that she is famous for not sleeping with Henry for years (until right before they were married) and she also promised that she would bear him a son and heir. When listening to the music one can almost imagine Anne standing before Henry, making him these promises through music. That being said, there are scholars on the other side who say that Anne wasn’t the owner of the Songbook, or at least the original owner. Those arguments can actually give us even further insight into the life of Anne. When she first left England, Anne went to the court of Margaret of Austria, as noted earlier, in Malines. Then she went to the French court to work under Mary Tudor, who was the new bride to Louis XII. When he died and Mary returned to England, Anne stayed behind because she was close to Claude, the Duchess of Brittany who would later become Queen of France. She also became close with Louise of Savoy (1476–1531), the mother of Francis I, and Marguerite d’Angoulême/Alençon (1492– 1549), his sister who would also become the Queen of Navarre. In Early Modern Women: An Interdisciplinary Journal (Vol.4, 2009) Lisa Urkevich points to the decoration of the early part of the book being in the style that was popular just before Anne came to court, and believes that it was commissioned for a wedding involving either Marguerite d’Alençon or her mother, Louise of Savoy. Urkevich writes that it was most likely Marguerite because the poet who wrote Jouyssance vous donneray was Clément Marot, a friend of Marguerite (which, if true, sadly voids the tantalizing idea that the music was set specifically for Anne and Henry). Additionally, the fact that Anne’s name is in the middle of the book, rather than the front, points to the notion that she was not the original recipient. It doesn’t look like the kind of writing we would expect to see in a dedication; to start with, it’s very small, and not decorated with any sort of color. Anne only used the title “Mistress” before 1529, when she would not have been in a position to commission such a work. But it is written with intentionality, not scribbled haphazardly, and the inclusion of her father’s motto shows that the person writing it cared about her family. So the theory, according to Urkevich, goes that Marguerite gave her own book to Anne when she found out she would be leaving to go back to England for a proposed marriage. It would be a perfect gift, seeing as how it was originally commissioned for a wedding, and it also shows just how important music was to Anne, that this was the gift Marguerite chose to give her. Either way, we can most likely place the Songbook in her possession by the time she left France. Once she was Queen, over a decade later, she wouldn’t have had much time to keep adding to it. The album by Alamire, Anne Boleyn’s Songbook, includes 18 of the 42 pieces in the book with a 19th that isn’t part of it, but is linked to Anne. “O Deathe, Rock me Asleep” is a poem believed to have been written by Anne when she was in the Tower awaiting execution. Let thy sound my death tell. We can imagine Anne, with her very sophisticated tastes in music, writing this poetry, taking comfort in the music she loved all her life, and preparing herself for her death in a very personal way. Of course there are also those who believe that the poem was written by Mark Smeaton, the poor lutenist going to the gallows along with her, or even another victim of the Tower. But the sentiment is moving, and it’s a fitting way to end a musical contemplation on the life and passions of Anne. The album, Anne Boleyn’s Songbook, from the Alamire Consort is available for purchase and download through iTunes, Amazon, and all places where classical music is sold. Additionally, as a further piece of background information, I interviewed David Skinner in Cambridge this past July for my podcast where he talked about changes in the music of the 16th Century and not just Anne Boleyn’s Songbook.